Religion • Salt Lake church strikes a blow against extremism. Francisco Kjolseth | The Salt Lake Tribune Wasatch Presbyterian Church pastor Scott Delgarno and the board are buying dozens of copies of the Qur'an and having them placed at the King's English Bookstore to give away for free. This is to counter the message of Florida pastor Terry Jones, who burned the Qur'an. In each, they're putting a book mark that says "This book was donated by the leaders of Wasatch Presbyterian Church, who are not afraid of truth wherever it can be found." Francisco Kjolseth | The Salt Lake Tribune Wasatch Presbyterian Church pastor Scott Delgarno and the board are buying dozens of copies of the Qur'an and having them placed at the King's English Bookstore to give away for free. This is to counter the message of Florida pastor Terry Jones, who burned the Qur'an. In each, they're putting a book mark that says "This book was donated by the leaders of Wasatch Presbyterian Church, who are not afraid of truth wherever it can be found." 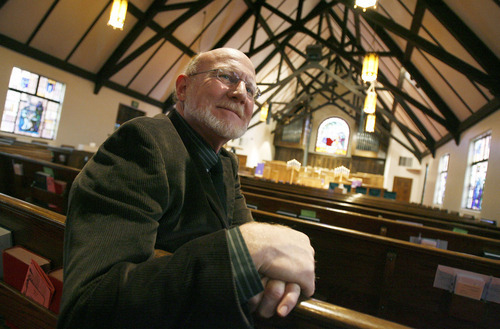 Leaders of a Presbyterian congregation in Salt Lake City have an answer to the Florida pastor with a penchant for burning the Quran. 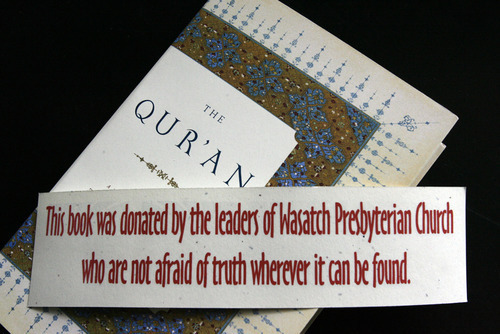 Wasatch Presbyterian Church is giving Islam's holy book away for free. "Sometimes, it's hard to know how to push back against the lunatic fringe," said Russell Fericks, a member of the session, or governing board, of the 350-member church on the city's east side. So when the new pastor, the Rev. Scott Dalgarno, asked the board last week to join him in opening their wallets, the reaction was swift. The leaders put up $600 before the meeting was over and ordered dozens of copies of an Oxford Press edition of the Quran several days ago. The books will be available as early as Monday at King's English Bookshop, each with a bookmark bearing these words: "This book was donated by the leaders of Wasatch Presbyterian Church, who are not afraid of truth wherever it can be found." "You don't have to let the nincompoops of the world control all the message," he said. Terry Jones, the Gainesville, Fla., pastor who backed down from his threat to torch the Quran last fall, nonetheless supervised burning of the book at his church on March 20. The mainstream media in Florida deliberately ignored the stunt, but when word leaked out  and Jones videos were posted on the Internet  riots erupted in Afghanistan, killing 20 and injuring dozens more. It was the kind of violent reaction in the Muslim world that the nation's leaders had predicted last fall when Jones first made his threats. The pastor has been unapologetic about his role in triggering the violence, and he was in a Dearborn, Mich., courtroom on Thursday, arguing for his right to protest outside a mosque during Friday's prayers. According to the Detroit Free Press, Dearborn authorities want Jones to post a bond that would cover law enforcement costs, but Jones demanded a trial by jury and will get one Friday morning. The imam who persuaded Jones last fall not to burn the Quran, Orlando-based Muhammed Musri, was in Salt Lake City this week to address the Salt Lake City Committee on Foreign Relations. Musri praised Wasatch Presbyterian's gesture as the kind of move that will remind people that the radicals don't represent either religious tradition. "The voice of the people in the middle  us  is being swamped." Delgarno said he borrowed the idea of giving away Islam's holy book from an associate pastor at his past church, Westminster Presbyterian in Portland, Ore. That church bought  and gave away  the Quran while Jones was making his threats last fall. "It gave the leadership of the church there a sense of power to do something in the face of that," Delgarno said. "It seemed all the more important now that the act was done and people have actually died." "We owe it to our faith and to all those who have handed it down to us ... to separate ourselves from those who do, and provoke, violence," Delgarno said. "Maybe we will inspire an imam somewhere to give away some Bibles." Giving away another faith's holy book, he said, fits well with Presbyterian tenets that emphasize individual conscience and educating one's conscience. "It's not enough just to follow your conscience because it may lead you to, well, burn the Quran," Delgarno said. "But conscience aided by education can do remarkable things."